Panel discussion following the screening of “Boko Haram: Journey from Evil” at the United States Institute of Peace, November 2, 2017. Voice of America’s new documentary, “Boko Harm: Journey from Evil,” launched at a series of events in Washington D.C. and London, beginning at the end of October. What started as 18 hours of behind-the-scenes Boko Haram footage obtained by VOA editor Ibrahim Ahmed, developed into a feature length film. Narrated by award-winning British-Nigerian actor David Oyelowo, the 55-minute documentary delivers an in-depth examination of the terror group Boko Haram and portrays some of the Nigerians who are fighting back. 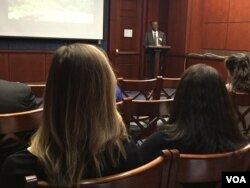 VOA Hausa’s Ibrahim Ahmed recalls his experiences reporting from a region ravaged by terror group, Boko Haram, at a screening for Hill staffers, October 31, 2017. The documentary was first previewed at three Washington D.C. venues: a discussion roundtable at the Council of Foreign Relations, and screenings and discussions at the U.S. Agency for International Development and at the U.S. Capitol Visitors Center. The documentary premiered on November 2 at the United States Institute of Peace in Washington D.C. The event attracted an overflow crowd, including featured documentary subjects Bukky Shonibare, the founder of the “Bring Back Our Girls Movement”, and photographer Fati Abubaker and creator of “Bits of Borno”, a photography project chronicling life in the Borno state of Nigeria. Shonibare, Abubaker, Sharif Katib, North East Regional Initiative, Oge Onabugu, USIP Africa programs office, and members of the documentary production team participated in a post-screening discussion about the film. 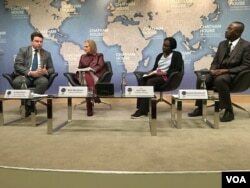 Panel discussion following the screening of “Boko Haram: Journey From Evil” at Chatham House, London, November 8, 2017.